Legends of Springsteen: Comic Book Review - "Wings for Wheels: A Tribute to Bruce Springsteen"
Comic Book Review - "Wings for Wheels: A Tribute to Bruce Springsteen"
Although this blog has been producing a regular stream of articles each week, it is admittedly still in its nascent stages, as we try to find an audience and refine our writing skills. In this task, I have taken great joy in exploring all aspects of my life, such as my love of gambling and my hatred of bees, and seeing how I can tie them in to Springsteen. However, there is one subject that has yet to come up on the blog that has played a major role in my life: comic books. Out of all the influences in my life from outside of my family and friends, comic books have had more impact on me than Bruce Springsteen. But, they were always two different worlds in my life; there were comic book discussions, and there were Bruce Springsteen discussions, and never the two shall meet. Until now. 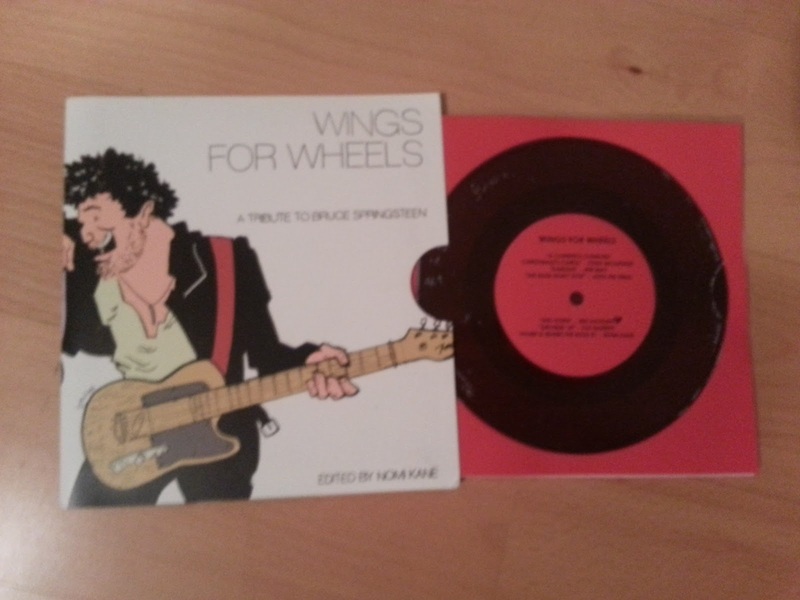 Yes, that is a picture of "Wings for Wheels: A Tribute to Bruce Springsteen", a comic book anthology published in September of last year. I stumbled upon this comic last weekend at the MoCCa Arts Fest. The MoCCa (short for Museum of Comics and Cartoon art) Arts Fest in a comic show that spotlights small press publishers - you won't find Spider-Man and Batman here. It has been going on for 11 years, and I myself was a regular patron for the first five years (while I was in high school and college). But, as I got older, I found myself with more distractions (girls, jobs, booze), and lost touch with the independent comic world. However, after visiting the San Diego Comic Con in the summer of 2011, I fell in love with the comic medium again. With my girlfriend preoccupied with acting duties, I decided to spend a beautiful spring New York City day inside a comic book art show. It was a bit disconcerting at first - all the names I knew and loved from my college days were no longer there, replaced by young talent. I roamed the aisles, trying not to spend too much money (back in the day, I'd easily drop over $100 at this show). However, when I passed "Wings For Wheels" at artist Pat Barret's table, I knew I had to open up the wallet. This was too good to pass up. I'd say the packaging alone is worth the $6.00. It has an incredibly unique design for the comic book, as it is in a record sleeve, and the book itself is designed to look like a record (it even has a raised plastic surface, to simulate that 45 record feeling). Plus, Dan McCool's in-color recreation of Born To Run is certainly eye-catching. Inside, we are treated to an eclectic range of stories. Each story is about 5 to 8 pages long, so the stories are very simple and fast-paced, which is to be expected in small press anthologies. Jen Vaughn (who was also at the convention and gracious enough to sign my book) and Nomi Kane (the editor) both provide classic "getting into Bruce" stories, which reminded me of the tales that began this very website. Like your three lovely blog writers, these cartoonists also credit their parents with passing on Springsteen to the next generation. Josh PM Press also provides a quick slice-of-life involving a man go hog-wild at a karaoke bar. It is a simple, one-joke story, but very relateable. These previous three stories are the most grounded in reality, and will probably be the ones that those new to comics would appreciate the most. However, I went to the comic convention looking for the strange and off-beat, and I found them with two stories here. Pat Barret's "Growin' Up" starts as a conversation between friends about their childhoods, and within five pages, various Springsteens throughout history are battling each other. Honestly, having reread it, I'm still uncertain how the story ended up there, but it made me laugh. Todd McArthur's story is the lead-off for this anthology, and stars the late great Clarence Clemons. Here, a young, cheap man ponders if he can spend $120 on a Springsteen concert ticket, and Clarence walks him through the same conversation we've all had in our heads. It is funny and somewhat depressing, and contains perhaps the coolest visual in the book: a giant Clarence, with angel wings made out of saxophones, surrounded by two cherubic Springsteens. Throughout the book, there are collages by artist Jen May that separate each story, but I found these a built difficult to understand. It is a small quibble. As I said before, the comics world and the Springsteen world have never made contact before, and as a first effort, I'd say this comic was a success. Now, Bruce, the ball is in your court: let's hear a tune about a man who was working real hard trying to get his hands clean, then gets struck by lightening, gains superpowers, and fights crime.